Welcome to Tax Season! Paying taxes is something that we all have in common; however, a select few of us will get a refund this year. We will suddenly have a lot more cash on hand than usual and will be faced with many opportunities and ways to spend it. For those of us who have dreams of owning a home someday, this refund could be what gets us in the door– literally. Equity Resources is proud to offer a number of different mortgage programs, starting with $0 down. No matter what your refund amounts to, you can use it on a down payment, closing costs, renovating or furnishing your new home, or simply setting up a rainy day fund. Maybe you are saving up to put 10% down. Could your tax refund make the difference and get you in a new home sooner? Across the nation, home prices are increasing. This has motivated many people to start their home search earlier than expected, hoping to get into lucrative neighborhoods or new construction while they can still afford it. While that may seem stressful, don’t fret: Owning a home is one of the safest, simplest ways to build wealth. As home values will only continue to increase in many cities across the US, investing your tax refund in a home could yield a profit in just a few years. Make sure you arrange for your tax refund to be deposited in your account through direct deposit. If you opt to receive a check, that’s okay too. Just make sure that you get a copy of it in case we need one. If for some reason you cash the tax refund check, we can only use that money for a down payment if you deposit it into your account within 60 days of closing. 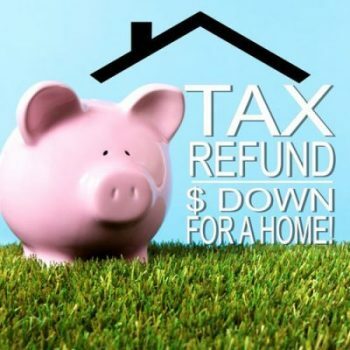 Consider purchasing a home with this year’s tax refund. A little extra money can make a BIG difference. Visit https://callequity.net/locations/ to find a Mortgage Specialist near you, or call us at 1-800-270-7082.